As part of the manuscript preparation process, Enago provides end-to-end author services through its suite of high-quality English Editing services. The objective of providing these services is to assist university researchers in getting their research papers published in peer-reviewed international journals. We provide highly customized support under our three service-level offerings: Language Check, Copyediting and Substantive Editing. Our Publication Support services are designed to guide university researchers seamlessly through the submission process. Utilizing our expertise, you can drastically enhance the chances of your researchers’ work getting published in high impact journals. We provide two Publication Support packages to suit individual requirements: Easy Go Pack and Full Support Pack. As part of our Author Education services, Enago provides authors comprehensive and up-to-date academic writing and publishing resources. We also conduct international training workshops at universities to help university researchers improve the quality of their manuscripts as well as gain significant momentum in their research careers. Qualitative & Quantitative growth in overall University publications Universities have reported a 40 to 50 per cent improvement in international publication after accessing Enago' s services. Refer to our Published Papers section for more information. "Two-Editor" System and Native English Speaking EditorsTwo Expert Professional editors will work on your manuscript. Our editors are from native English speaking countries - 75% of our editors are from US and UK. Specialized Subject Area MatchingAt Enago, we believe that quality can be only achieved when editors knows the subject well. We manage our editors by 3-layer structure to ensure that your manuscript is edited by the specialized subject area expert. The Enago PromiseWe guarantee that any paper edited by us would not get rejected by a journal because of English language issues. We offer free editing for resubmission if it does happen. Our stringent systems and processes, professional editors, quality management systems help us in delivering this promise to authors. Enago Academy, a platform for knowledge sharing among the scholarly community, offers comprehensive and up-to-date resources as well as training workshops on academic writing and publishing. 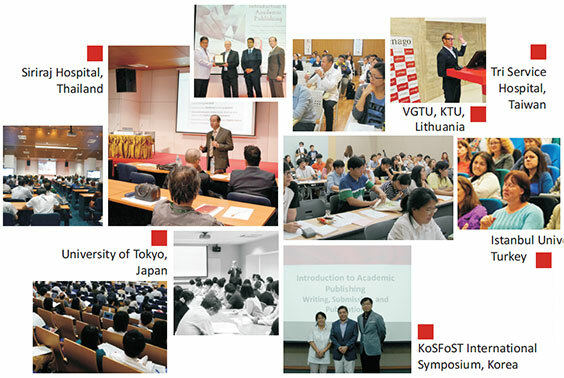 Enago Academy has till date conducted several successful and interactive Author Workshops in top universities across key research-oriented countries such as Japan, Korea, China, Taiwan, Turkey, Thailand, Brazil, CIS, and Middle East. The topics of workshops have ranged from teaching best practices in research writing to explaining in detail the various stages of publication. The end objective of these workshops is for the researchers to gain significant momentum in their research careers and advance toward their goal of having successful international publications. Apart from providing comprehensive resources, quick tips, and downloadable handouts on academic research writing and the publication process, through the Enago Academy web platform, we aim to bring researchers closer to industry domain experts so that they know about different aspects and trends in academic research and publishing, well in advance. Our clients have successfully published their work in numerous international journals with high impact factors. Below are a few examples. Publisher : Elsevier B.V. Journal details : Cell Host & Microbe; Volume 8, Issue 6, 496-509, 16 December 2010 Impact factor : 13.62 Paper title : The Ubiquitin Ligase Riplet Is Essential for RIG-I-Dependent Innate Immune Responses to RNA Virus Infection Author : O. H.